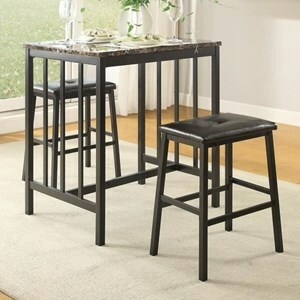 This Drop Leaf Table and two Side Chairs offer comfortable and stylish dining pieces for your home. 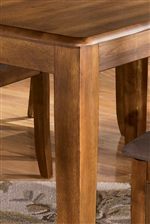 With a rich hickory stained finish and a microfiber upholstered seat, the chairs add a comfortable place to entertain friends and family around the Drop-Leaf Table. Round dining table features two drop leaves that make it ideal for flexible dining options and smaller spaces. The Berringer 3-Piece Drop Leaf Table & 2 Upholstered Side Chairs by Ashley Furniture at Casa Leaders Inc. in the Wilmington, Long Beach, Torrance, Lakewood, Los Angeles area. Product availability may vary. Contact us for the most current availability on this product. Table Info Drop Leaf Table. Two 8-inch drop leaves. Table is 42-inch diameter with leaves up. 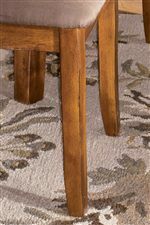 Width of table with both leaves down is 26". The Berringer collection is a great option if you are looking for Casual furniture in the Wilmington, Long Beach, Torrance, Lakewood, Los Angeles area. Browse other items in the Berringer collection from Casa Leaders Inc. in the Wilmington, Long Beach, Torrance, Lakewood, Los Angeles area.